We have one reader who currently uses a Verizon Galaxy S3. He's complaining about it because his phone randomly turns off or reboots all by itself. According to him, this issue has been happening for a couple of weeks now he called Verizon hotline but wasn't able to get the help he needed so he resorted to seeking help online. I hope you could help me with my problem. You see, I am a Verizon subscriber and I use the Samsung Galaxy S3 since last year. I am satisfied with my phone's performance until about a couple of weeks ago when it started to act weird. The thing is, the phone automatically turns off by itself at any time it likes to do so. Sometimes it would reboot itself while I'm using it. I have called the technical support of my provider but no one seems to be able to help me. I hope you could. Thanks. There are other problems related to the one our reader is experiencing. Other owners complained about their phone shutting down randomly but does not restart, others said their device turns off during phone calls (both incoming and outgoing), and some complained about not being able to turn their phone on without removing the battery first. It is almost automatic for us to think that when a phone restarts or shuts down by itself that it's the battery that's having some problems and you we may be right. However, there are also possibilities that the root causes of the problem are third-party apps that were installed on the device, the phone's hardware, or just a loose placement of the battery. Step 1: When the device turns off, press the Power key and see if the screens powers back on immediately. If it does, the phone didn't turn itself off but just went to sleep mode. If you don't like such behavior of the phone, adjust its backlight settings to stay a little longer. Step 2: If the problem happened shortly after you installed some apps, then you need to examine those apps one-by-one to determine if they are indeed the cause of the problem. List down each app and try disabling them one after the other to see if the phone turns off or restarts after you disabled them. If the phone behaves normally after doing so, uninstall the culprit and enable back the others. Step 3: Check your phone to see if it has physical or liquid damage. Try to find some cracks or signs that the phone fell. If you can find one, then the trauma may have damaged the phone to the extend that it won't come on normally. As for the liquid damage, it's easy to check it as well; take the back panel of your phone off and remove the battery. On the back of the phone just below the sticker, there is a little square indicator colored white. If you can see read then it means the phone has been damaged by some liquid. You could also find an indicator on the battery itself. In any case that your phone suffered any of the damages mentioned above, have it checked by a repairman or bring it back to the store where you bought it. Step 4: Make sure the battery is well-fitted but please start by verifying you're using the original (OEM) battery. Remove it from the phone and re-insert it to make sure it's placed just right and not loose with its interface touching the connectors on the back of the phone. Then, turn the phone on and observe if it still experiencing the same problem. There is no guarantee that the steps above could solve the problem. 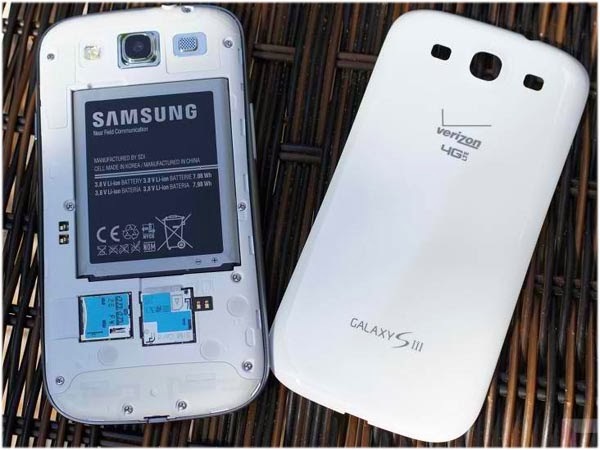 So, if the issue persists, you need to contact Verizon or have the phone repaired by an authorized technician. If you're still under warranty, don't try to fix the internal hardware of the phone or you will end up voiding your phone's warranty. Tell us your problem in detail and we might just be able to help you solve it. Email us at sebertech@gmail.com and we will try to find solutions for you.